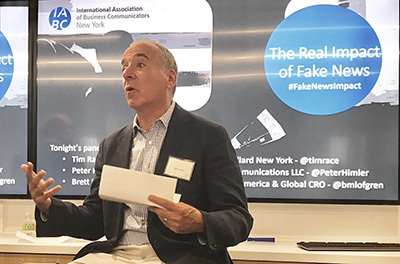 IABC New York recently convened a panel exploring the subject of fake news and, specifically, its relevance (and danger) to the public relations professional. Joining the session, held at Fleishman-Hillard’s NYC offices, were: FH executive and former New York Times veteran editor Tim Race, Brett Lofgren, President, North America and Global CRO of NewsWhip and PR industry veteran Peter Himler, founding principal of Flatiron Communications. It was moderated by New York IABC chief Andrew Tingley. The write-up is posted here.